Chicago Belize Day in the Park is a family and community oriented event that has been promoting Belizean culture in the windy city of Chicago for more than 30 years. The event, which began in the 80's, has grown to become America's official Belizean celebration in the Land of Lincoln. 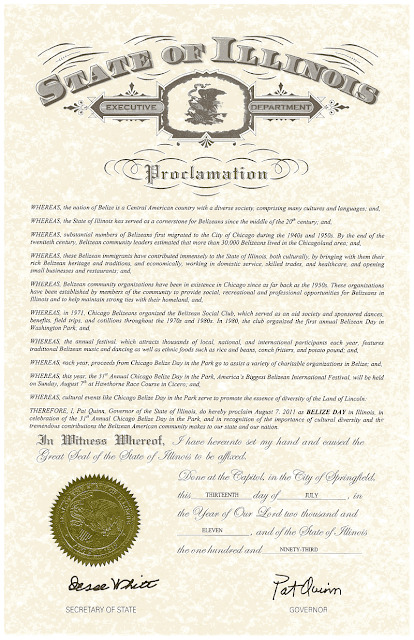 Belize Day in the Park was honored by former Chicago Mayor Richard M. Daley in 1998 by declaring the First week of August as "Chicago Belize Day at the Park". And in 2011, Illinois Governor Pat Quinn proclaimed August 7th as BELIZE DAY in the State of Illinois. The event features Belize's local and international acts, great cuisine, local media and a sense of pride the Belizean community carries within anywhere on the planet.